To verify this, I ran a test on my IC-756Pro II. Transmitting at 28.5 MHz USB, with a 10W 25 ~ 60 MHz Bird element and the mic unplugged, I noticed no deflection on the power meter with Po set to 100W, for any Mic Gain and settings with Comp on or off. (TX BW = MID for all tests). However, I did observe a 5 dB spike on the Spectrum Scope with � 12.5 kHz span. 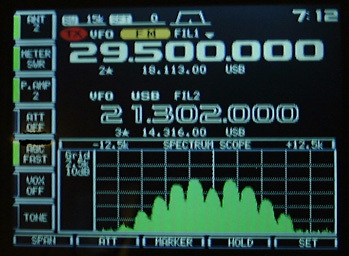 The DSP IDC function limits FM peak deviation to �5 kHz when the 15 kHz FM filter is selected via the FILTER menu. To set the Pro or Pro II correctly for FM (16K0F3E) on 6m or on 10m above 29.0 MHz, select the 15 kHz FM filter in the FILTER menu, then key the transmitter and whistle into the microphone. Set [MIC GAIN] to the point where deviation just limits at TOBW = 16 kHz at -26 dBc, as displayed on the scope. (The symmetrical sideband pairs are clearly visible on the display.) The transmitter is now correctly set up for FM operation. Similarly, FM peak deviation is limited to �2.5 kHz when the 10 or 7 kHz FM filter is selected. To operate NBFM (11K0F3E) on the HF bands below 29.0 MHz, select the 10 kHz FM IF filter, then set [MIC GAIN] for TOBW = 11 kHz at -26 dBc using the above procedure. This will comply with FCC Part 97.307(f)(1): No angle-modulated emission may have a modulation index greater than 1 at the highest modulation frequency. The 10 kHz IF filter will also yield an improved S/N ratio on receive, as IF bandwidth now more closely matches TOBW. In this context, the article entitled "The third-order intercept point" by Leif �sbrink SM5BSZ is a "must read". In this article, Leif explains why the much-touted IP3 is not a good figure of merit for a digital receiver. See Reference 9. In receive, the IF filter bandwidth is infinitely variable, in the range 50 Hz ~ 3.6 kHz. In addition, the lower and upper flanks of the IF bandpass can be shifted by up to � 600 Hz relative to virtual carrier via the Twin PBT controls. The scope system in the PRO/PRO II is fed from the combiner output (before the 64.455 MHz roofing filter) at an IF of 64.455 KHz via a PIN diode attenuator and separate IF stages to a mixer, which with a 77.8 MHz LO, down-converts to 13.345 MHz for the scope circuitry. There are two 13.35 MHz ceramic bandpass filters in cascade in the mixer output, which feeds another mixer with a 12.89 MHz ± 100 KHz LO to produce an output which via a 455 kHz ceramic bandpass filter (CFJ455K8) drives the scope IF system. Note that all of the above circuitry for the scope operation is completely independent of the circuitry following the first mixer which drives the actual receiver IF and subsequent circuitry, including the DSP. No compromises in receiver IF design are required to support scope operation. (Note: The CFJ455K8 filter defines the scope's resolution bandwidth as 1 kHz at -6 dB.) To increase its dynamic range, the scope incorporates an internal AGC loop derived from the vertical amplitude signal.